Where do they go at night? Into the woods. Stunning Moose design. 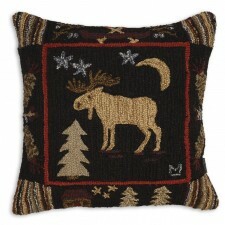 Extra large 26" square hand hooked pillow for comfortable seating, 100% New Zealand wool. Zippered velveteen backing with poly-fill pillow insert. Designed by Laura Megroz. Size: 26" x 26" x 8"
Item: G4C-265 Price: $150 ea. The Kevlar Canadian Tripper. Length 17'4" and weighing in at a mere 42lbs. E-fused epoxy Kevlar layup . This model takes it's elegant lines from the Atkinson Traveler and is the ultimate tripping canoe. Wood trim, contoured seats, and deep-dish yoke are all standard. Also available PROSPECTOR 15' & 16'6' Kevlar E-fusion models and the SPIRIT 16 Recreation canoe. We would like to get lots of these canoes out on the water, so please call for availability.